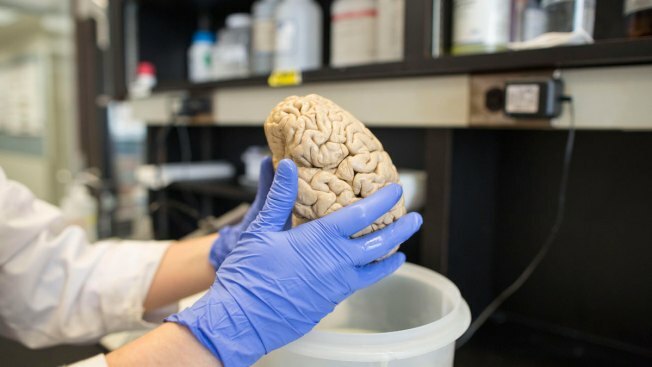 In this July 29, 2013 file photo, a researcher holds a human brain in a laboratory at Northwestern University's cognitive neurology and Alzheimer's disease center in Chicago. An experimental drug being tested to see if it can treat Alzheimer’s disease helped slow the inevitable loss of clear thinking and memory that comes with the condition, researchers reported Wednesday. It’s a rare success in a field littered with failures. No drug has yet been shown to reverse the symptoms of Alzheimer’s, which affects more than 5 million Americans and has no cure, NBC News reported. And this one is no home run. Everyone who took the drug continued to get worse. But those who got the highest doses got worse more slowly.